President Trump on Friday sought to undo the damage he’d done to British Prime Minister Theresa May, lavishing her with compliments one day after he was quoted in a British tabloid dismissing her approach to Brexit, praising one of her foes and threatening to upend their trade relationship — while boasting that she would have been better off listening to him. Trump, who prides himself on never apologizing, came close to offering something of an apology for his unvarnished remarks. But he largely blamed the Sun, Rupert Murdoch’s British newspaper, for leaving out the positive things he’d said about May. The interview overshadowed much of his first official trip to Britain in capitalized headlines and a torrent of TV coverage. “Whatever you’re going to do is okay with us. Just make sure we can trade together,” Trump said. May also downplayed Trump’s remarks in the Sun, even while her staff was stunned and members of her party complained about how rude a guest Trump was. 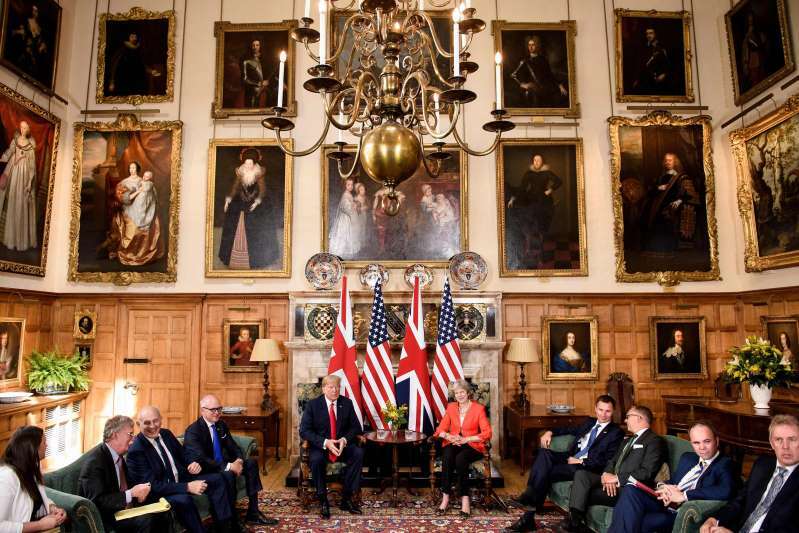 Trump and May visited a military base early Friday and had lunch at Chequers. Then he left to have tea with Queen Elizabeth II at Windsor Castle. The body language of that highly symbolic meeting was always going to be closely scrutinized. It didn’t go without notice that, even though it’s not mandatory, that Trump and the first lady did not bow or curtsy when they greeted the queen. Later, during an inspection of guardsmen, Trump momentarily eclipsed the queen, moving in front of her and then stopping, apparently looking to see where she was. The queen navigated her way around him. The British press was divided over whether Trump simply stumbled over a bit of royal stagecraft or breached protocol. Trump is deeply unpopular in Britain and has largely avoided London, where a large blimp mocking him flew above mass protests Friday. Still, his comments in the Sun caused May intense embarrassment in a week when her cabinet is beset by division, her compromise plan to exit the European Union is being excoriated by her domestic critics and rebels in her Conservative Party are threatening a no-confidence vote. She had been looking to Trump in this visit to help her sell her Brexit plan by promising generous bilateral trade deals for Britain after it leaves the European Union. May’s advisers said that the news conference was a welcome relief — and that the trip was salvaged from disaster. Trump still reiterated his praise for Boris Johnson, May’s rival, who resigned as foreign secretary this week in protest over May’s Brexit approach. Trump explained his comments to the Sun about Johnson in terms of himself, as he often does. “I said he’ll be a great prime minister. He’s been very nice to me. He’s been saying very good things about me as president,” Trump said. Johnson last month said that Trump would do a better job than May has done negotiating Brexit. Trump and May, who were seen holding hands while strolling around the country estate as farm animals brayed in the distance, differed in both substance and style in the news conference. The two have previously squabbled over immigration, as recently as the Group of Seven meeting last month in Canada, aides said. “I think it’s a horrible thing that Germany’s doing,” he said. May said only that the project would be discussed further within the European Union. spending. (The United States accounted for 68.7 percent of NATO members’ combined defense spending last year, reflecting its superpower status and 3.57 percent of gross domestic product.) Trump also overstated the trade deficit with China and the number of troops in Germany. “I would call it the rigged witch hunt,” he said at one point of Robert S. Mueller III’s investigation, dissecting the testimony of FBI agent Peter Strzok and lamenting that he didn’t watch more of it Thursday because of the time difference. May was far more precise and short in her answers, did not attack political foes or the media and was determined to avoid all criticism of Trump — even as she faced nonstop questions about his dismissals of her. Trump said he plans to raise a range of topics in his summit Monday with Russian President Vladi­mir Putin in Helsinki, including nuclear proliferation, which Trump said he considers the largest problem facing the world. He declined to say whether he would make a deal with Putin on Syria. Some are fearful that Trump will pull troops out of the region. The president also pledged to raise the issue of election meddling during the summit and said he would tell Putin not to interfere in future U.S. elections. He said “we’ll see” about Crimea, which Putin illegally annexed in 2014 to the derision of the world. Trump said again that he thought he could get along with Putin. “This was an Obama disaster. And I think if I were president then, he would not have taken over Crimea,” Trump said, fending off a tough question about Putin’s annexation — the main point of contention for NATO allies — by blaming his predecessor.